As the first of two one-off events this Friday evening, John Fricke presents a series of outtakes and rare sections of film capturing Judy Garland from her earliest surviving film footage (as a child with her sisters) to outtakes from several of her most successful M-G-M films (including “March of the Doogies” from The Harvey Girls and “Mr. Monotony” from Easter Parade). As is common with the items in this festival, tonight’s offerings are familiar to me on the small screen but for me never before seen on the big screen. And bonus: John Fricke provides context and humor and transitional details that illuminate, educate and entertain throughout the presentation. 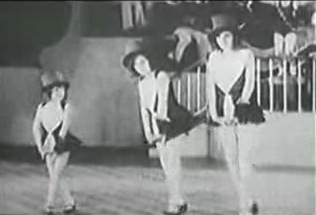 Judy, then still Frances Gumm, far left, performs in 1929 with her sisters in “Good Old Sunny South”. Singing “The Land of Let’s Pretend” in a 1929 Vitaphone Varieties short, little Frances earns some extended closeups. From 1929 survive two film excerpts featuring the three Gumm sisters (Suzi, Jimmy, and little Frances) when they appear with other children in film shorts — vaudeville-like multi-act presentations. While Fricke does not mention these facts in this particular presentation, my own research on Garland Chicago performance history and oft-cited Garland biographical facts reveal that the performing name “Judy” for the youngest sister and adopted surname “Garland” are both finalized when the act is in Chicago during the second year of the 1933-1934 World’s Fair. At the time of the first segments this evening, all the girls are performing under their birth names, the Gumm Sisters (“not the Wrigley Sisters” as one lame joke as introduction goes in one of the shorts). The delight is in seeing the already present riveting stage presence and absolute comfort child performer Frances has on stage and on set, and her focus on both her audience (here a camera) and her co-performers. I thought of many moments of watching the adult Garland gazing at and playing off of guests on her shows and specials while watching Baby Gumm here gaze at her older sisters. “Give me a child until he is seven and I will give you the man.” (Jesuit motto attributed to Francis Xavier the co-founder of the Jesuit Order). The core of the entertainer is, definitely, here at seven. Judy. “Over the Rainbow” for the men and woman overseas in Command Performance. 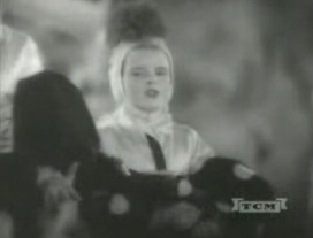 Other rare clips include a 1936 short subject with Deanna Durbin entitled “Every Sunday” (in which the two girls illustrate jazz/swing and operatic singing styles), a 1937 distributor Christmas short with Judy singing “Silent Night”, and a bittersweet 1940 Will Rogers Institute tribute to the great entertainer “If We Forget You”. 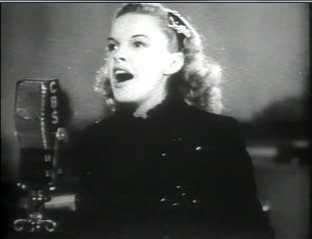 A particularly heartbreaking 1943 contribution to the evening provides an achingly beautiful time of Garland’s youth, a rich version of “Over the Rainbow”, and a view into the collaborative efforts the entertainment industry engaged in with the military — this performance is part of a show recorded especially for distribution to service men and women around the world. Jane Falbury in “Get Happy” with prostrate chorus boys. Summer Stock (1950). Hannah Brown in “Mr. Monotony”. Easter Parade (1948). The final segment presented is a now familiar outtake from Easter Parade — Judy as Hannah Brown in stockings, a dress jacket, pink chiffon scarf, a fedora, and not much else delivers the delightful jazzy story of love, loss and attitude “Mr. Monotony”. The final 1948 cut of Easter Parade excludes this number and this costume, but fortunately for Garland fans the costume re-emerges in the finale “Get Happy” number of 1950’s Summer Stock. Outtakes survive and all is well with the world. And as with all other content in this delicious “Summer of Garland”, I emerge more informed, more enriched, more delighted with Ms. Garland that I have been before.